For about half an hour, Smith and Sandoval were the only ones holding down the broadcast for one of Houston's major news stations. KHOU reporter Brandi Smith and photographer Mario Sandoval kept reporting on Hurricane Harvey. Early Sunday morning, Bill Bishop, managing editor of KHOU 11 News, arrived at his station's headquarters to find floodwaters from Harvey creeping into the building and soaking the carpet. The station was just south of Buffalo Bayou, whose banks had swollen after 24 hours of torrential rain. And it was only going to get worse. Still, the station had a newscast to produce. Employees began moving operations upstairs, Bishop said on Twitter. Soon, KHOU had set up a makeshift studio on the second floor of the building and continued to broadcast live about the storm wreaking what officials called "catastrophic" flooding upon the country's fourth-largest city. Within an hour, however, water was quickly rushing through the front doors of the building. By 10:30 a.m. local time, safety concerns prevailed and KHOU employees started evacuating the station. Bishop's last tweets from the station showed the entire first-floor lobby submerged in several inches of water and a veritable lake forming outside the windows. But the broadcast wasn't abandoned entirely. 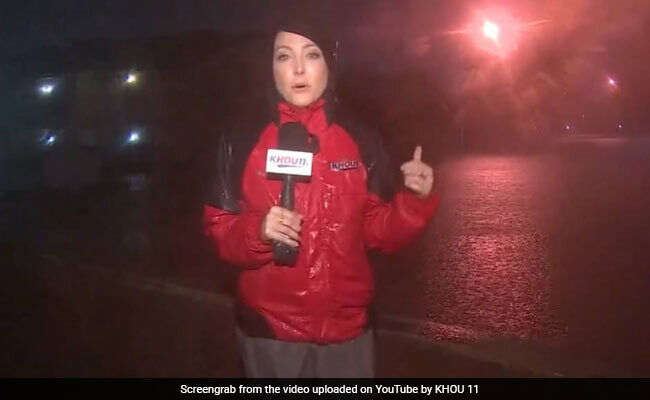 KHOU reporter Brandi Smith and photographer Mario Sandoval remained out in the field, transmitting live feeds from near Beltway 8 and Hardy Toll Road on the north side of Houston. For about half an hour, Smith and Sandoval were the only ones holding down the broadcast for one of Houston's major news stations. "Nothing is more valuable than your life and the lives of your family members, those you love, your friends," Smith said in her solo broadcast, her voice cracking. "Sometimes we get flak because, yes, we are out in it. We are doing the things we tell you not to do. We do it so that we can show you how bad the conditions are so you do not attempt them." While reporting on the submerged feeder roads there, Smith said, Sandoval had spotted a semitrailer truck driver trapped in the floodwaters. Smith happened to see Harris County sheriff's deputies coming on Beltway 8 and flagged them down to report the trapped truck driver. For "I don't even know how long," Smith remained on air as they waited for a rescue boat to reach the window of the truck's cab and extricate him to safety. "I don't have any word on how long he's been there or what kind of condition he's in," she said. "I'm sure he's very wet, very cold, very frightened. I am terrified for him, so I can't imagine the level of fear he has here." As the driver was pulled out to safety, Smith's relief was palpable. "And here he comes!" Smith said. "I feel like I can finally breathe kind of a sigh of relief that he is OK."
Only later, Smith said on Facebook, did she and Sandoval realize they had been knocked off the air at some point in their broadcast. But their composure and steadfast reporting as they represented KHOU while their newsroom evacuated won them much praise and respect from colleagues and viewers - and from journalists at competing stations. According to the station, its newsroom last flooded in 2001 when Tropical Storm Allison hit Harris County. As it neared noon on Sunday, KHOU's live stream remained down, though its reporters continued providing updates on social media. After the truck driver's rescue, Smith and Sandoval were "hunkering down" while the station was off air, a colleague said.